The Marshall Legacy Institute wishes all of our supporters, friends, and donors a joyful holiday season! In the past year, you have helped us donate 16 lifesaving mine detection dogs to Armenia, Bosnia Herzegovina, Lebanon, and Iraqi Kurdistan. 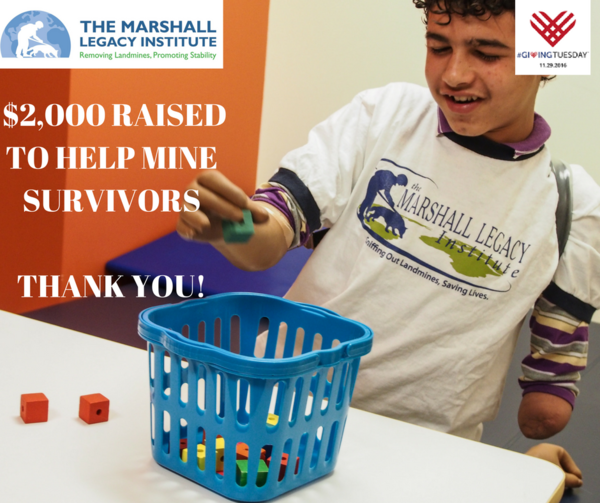 With your support, we have provided prosthetic limbs, medical care, and vocational training to nearly 300 landmine survivors, and we have connected children in America with youth in mine-affected countries so they may work together to bring peace and prosperity to vulnerable communities. Simply direct your donation to "Holiday Gift Donation Made in Honor of a Loved One" on our donation page and let us know how many cards you would like! We will get them in the mail for you right away. You may also call us at (703-243-9200) or text "MLISaves" and the dollar amount you wish to donate to 50155. 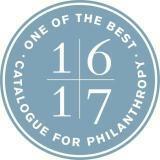 #GIVINGTUESDAY Success - Thanks to You! Our "Give the Gift of Freedom from Fear" campaign continues! Don't forget to dedicate your gift to a person you love and let them know how you are making a difference in someone's life this holiday season! Thank you for your continued support! In 2016, the Marshall Legacy Institute donated six mine and explosive detection dogs to Iraqi Kurdistan. Two of the lifesaving dogs replaced aging mine detection dogs (MDDs) with Mines Advisory Group (MAG) who had earned a well-deserved retirement. The other four dogs were given to the Ministry of Peshmerga, which requested a total of 18 dogs to meet urgent operational requirements. MLI is currently seeking private donors to sponsor the remaining 14 dogs. Over the past two years, the Peshmerga reports that more than 60% of the casualties they have suffered in their fight against ISIS have been from landmines and improvised explosive devices (IEDs), rather than through direct combat. 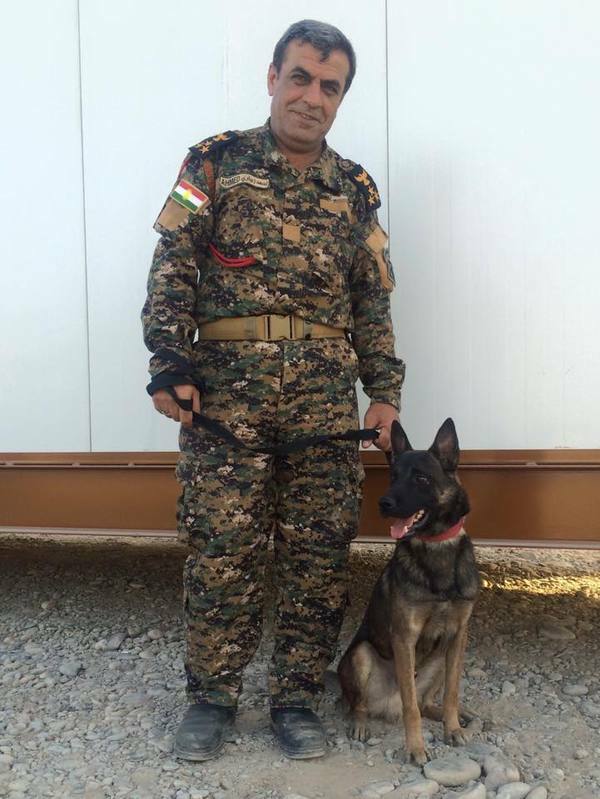 The six dogs we donated earlier this year include: Nam (sponsored by the USMA Class of 1970), Woody (CHAMPS Glenelg), Troja (Hilda & Preston Davis Foundation), Cybil (Ms. Chandi Heffner), Josh (family of Steve and Jaqui Edelmann), and Scout (General Dynamics - pictured above, with Peshmerga Brigadier Ahmad Zebari). These dogs just completed their training and, once they pass the International Mine Action Standards certification test with their handler, will begin searching for mines and other dangerous explosives, helping to bring greater stability to the region and facilitating the return of refugees and IDPs to liberated areas. Now more than ever, MLI needs your help as we work to help the people of Iraqi Kurdistan by providing them with these life-saving dogs. If you are able, please consider making a donation to support this vital program in northern Iraq. Following decades of civil war and fighting between the Sri Lankan Government and the Liberation Tigers of Tamil Eelam, Sri Lanka was left riddled with mines. To help the country recover and allow people to live and walk their land in safety, MLI has donated 26 mine detection dogs and training to the Sri Lankan Army Engineer Regiment's Humanitarian Demining Unit (HDU). Since 2004, the work of these lifesaving canines has resulted in the release of 120 acres of land, which has been returned back to the people for productive use. One of the MDD teams, MDD Madjesty and his handler, Lance Corporal Nawarathne, was honored at our annual Clearing the Path Gala (see picture above) for their hard work, strong bond, and excellent performance in the field. While the demining efforts in Sri Lanka have enabled communities to return their land to productivity, so children can play and people can walk and work in safety, much more remains to be done before the country can declare itself mine-safe. 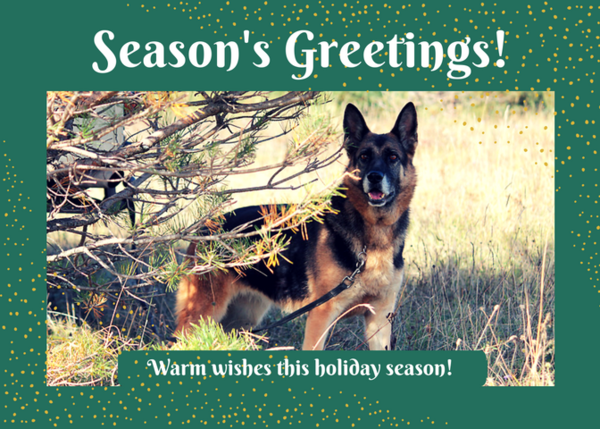 In 2017, MLI will provide four mine detection dogs to the HDU to replace canine heroes who have served the Sri Lankan people so much and will now enjoy a comfortable retirement. The Marshall Legacy Institute held its 19th Anniversary Clearing the Path Gala at the elegant Mandarin Oriental Hotel on October 26, 2016. During this incredible evening we were thrilled to have the Honorable Susan Rice, the U.S. National Security Advisor, join us and give a compelling keynote speech. 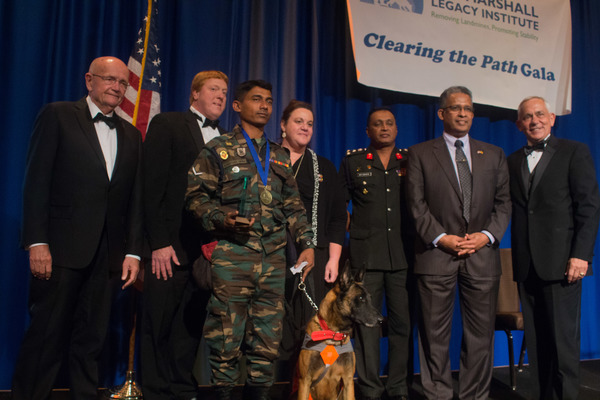 General Gordon R. Sullivan, MLI's Founder and Chairman, joined congressional and international leaders in presenting awards to Gala Honorees, which included Lance Corporal Nawarathne and his canine partner, Mine Detection Dog Madjesty, who received the 2016 MDD Team of the Year Award (see photo above); Ms. Labibah Abdo Saif, an inspiring landmine survivor from Yemen who received MLI's Survivor of the Year Award; and Mrs. Linda Shirley (Greenwich, CT) and Ms. Larisa Jahic (Pazaric, Bosnia Herzegovina), who received this year's CHAMPS U.S. and CHAMPS International Teacher of the Year Awards, respectively. Thank you to all of our sponsors, guests, and supporters, who have made our 19th Anniversary Gala a successful and memorable night! See more highlights from the evening here. Save the date for our 20th Anniversary Clearing the Path Gala, which will be held on October 24, 2017 at the gorgeous Fairmont Hotel in Washington, DC! We will feature previous honorees and look back at two decades of achievements in giving people back their freedom to walk without fear of mines! With the start of the new school year this fall, CHAMPS expanded in Bosnia Herzegovina to include three new schools located in Hadzici (March 6 School), Kiseljak (Kiseljak School), and Trnovo (Trnovo School). There are now six schools in Bosnia that are participating in an expanded version of CHAMPS that incorporates interethnic reconciliation and promotes friendship between the different ethnic groups in Bosnia Herzegovina. The three new schools, each representing a Bosniak, Croat, or Serb majority, will be working together with 'veteran' CHAMPS-Bosnia schools to continue promoting interethnic reconciliation and understanding between the communities through joint community service projects. All six schools also interact regularly via Skype with CHAMPS-U.S. schools, as the American youth work to raise funds to sponsor Mine Detection Dogs and help landmine survivors. The new CHAMPS schools in Bosnia have already started receiving mine risk education (MRE) from the Mine Detection Dog Center (MDDC) in Bosnia and will work towards raising awareness about the dangers of mines and other explosives in their communities. 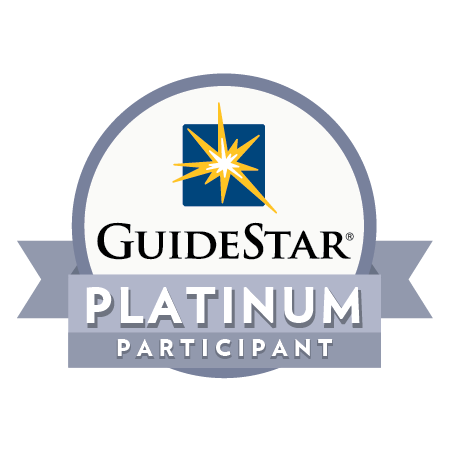 Are you interested in getting your school involved with CHAMPS or MLI's new Peace Makers and Problem Solvers Project, which targets older youth for leadership development? 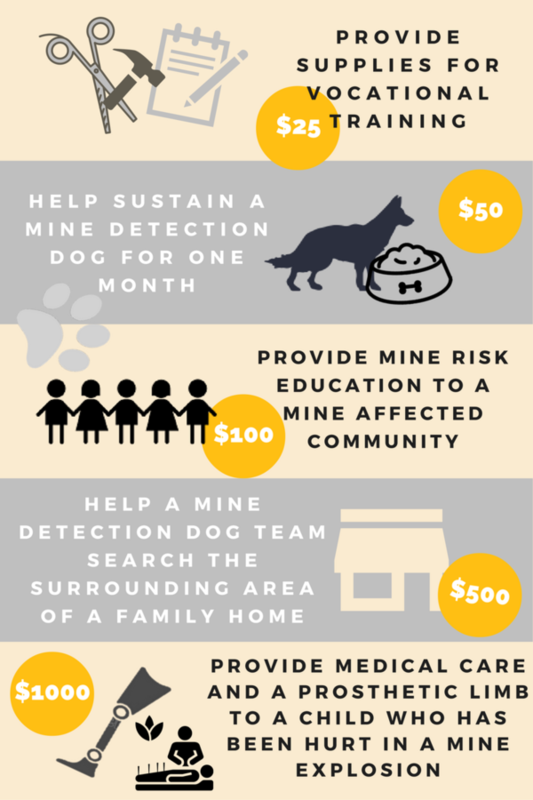 Contact us to find out more about our programs, live mine demonstrations by our hero Mine Detection Dogs, and how you can help landmine survivors around the world! Two young boys, Gameel Saleh and Abdul Al Baadany, both lost their right legs in landmine accidents in Yemen last year. MLI's CHAMPS program has been working hard this year to raise funds to help them and 150 other mine survivors like them in Yemen. Gameel was playing with friends outside of his school when he accidentally stepped on a landmine when he was just nine years old. Abdul was only eight when he also stepped on a mine during a family vacation. The boys suffered terribly, both mentally and physically, from these injuries and their families feared that they would never be able to walk again, as prostheses for children in Yemen are costly and nearly impossible to find. However, thanks to funds raised by the children at Glenelg Country School in Ellicott City, MD earlier this year, these boys and five other children received prosthetic legs this fall, along with intensive rehabilitative care to help them walk again, return to school, and have hope for the future!